The Grand Theft Auto franchise has been around for nearly two decades, and the series includes over a dozen titles. Some GTA games are excellent, others...not so much. Let’s take a moment to rank every GTA game, from worst to best. We originally ranked GTA games a few years back, but that was before GTA V—so, you can consider this an update of sorts. I built this list taking into account how these games play in 2017, rather than just going with my fond memories, which means some “classics” might be lower than you expect. Maybe you disagree with my rankings. That’s OK! Each entry also has some fun facts and bits of trivia, so don’t get too mad if [Insert Your Favorite GTA Game] doesn’t take the top spot. GTA Advance is a mediocre and ugly game that was likely hindered by the hardware. There’s only so much you can do on the GBA, after all. Due to lack of storage on GBA carts, each car has a short instrumental song that loops instead of the usual radio stations featured in GTA games. This gets repetitive quickly. FUN FACT: GTA Advance is a prequel to GTA III, and it actually explains why 8-Ball was arrested. It even shows King Courtney, a character that is only heard but not seen in GTA III. The game that started it all. And yet, GTA 1 is also the least necessary game to play in the main series. Everything within GTA 1 is majorly improved in future games. GTA 1 just hasn’t aged very well, thanks to difficulty spikes that vary from mission to mission. While technically these are mission packs for GTA 1, they added a ton of new content—including a brand new city to explore. GTA London 1969 was released on PC and PS1. GTA London 1961, a prequel, was released only on PC. Together, they are basically a new entry in the franchise. GTA London is kinda strange. It’s the only time GTA has been set in the 60’s and unlike every other game in the franchise, GTA London is set in a real city. This is also the first and only game to be set outside the US. Ironically the developer and creator of Grand Theft Auto, UK located Rockstar North, didn’t develop the only UK based GTA. Rockstar Toronto developed London 1969 and 1961. SAD FACT: The Crisp Brothers, who were villains in the game, were both secretly voiced by famous British novelist and art critic John Berger. Sadly, he recently passed away. From the characters the visuals, GTA 2 is zanier than GTA 1. Infamously, you could run over Hare Krishna members in GTA 1, but in GTA 2, they are an in-game faction warring with the Russian Mafia. That’s the difference between 1 and 2. Despite the silliness, GTA 2 is a better version of GTA 1, with improved graphics, sounds, and controls. FUN FACT: This was also the first and last time GTA would appear on a Sega console. The first 3D era game to appear on this list. I really enjoyed Liberty City Stories, but it had the unfortunate timing of being released after the mega-popular San Andreas. Almost every fan I know seemed disappointed by how bare bones and old Liberty City Stories felt. You couldn’t swim, you couldn’t crouch, you couldn’t fly helicopters or jetpacks or anything like that. It was a bummer. Still, LCS had some things going for it, like the addition of vehicles from San Andreas and Vice City into Liberty City. LCS also improved the aiming and shooting, lifting its combat controls from GTA San Andreas. But one reason this game is so low on my list is I don’t really like Tony Cipriani, the main protagonist. Cipriani is annoying, and his story is weak. FUN FACT: Tony Cipriani first appeared in GTA III as a characters who gave you missions. You might remember him as the dude who always seemed to be feuding with his loud, angry mother. GTA III’s charm is undeniable: I started playing recently with the intention of just grabbing a few minutes of footage, and ended up playing for nearly three hours instead. The story of GTA III feels focused and moves quickly. The game is also filled with memorable missions and characters, like Tony Cipriani and his loud mother, as well as Catalina, who famously shoots Claude in the face at the very start of the game. Missions can be a bit simple compared to later GTA games, but they’re still fun to play. Remember the mission that tasks you with stealing a high ranking Mafia member’s car, arming it with a bomb and then parking it back where he is currently eating lunch? Exciting stuff! Also excellent: using cheats to fly the tank. Man. FUN FACT: GTA III’s radio has references to Carcer City, the setting of Manhunt. Additionally, different cars from GTA III pop up in Manhunt, including the Blista Compact. And a bathroom in Manhunt is actually ripped directly out of GTA III. Chinatown Wars returns the GTA series to its top-down roots, except this time, it’s in Liberty City. Chinatown Wars includes an addicting drug dealing system. Sometimes deals go smoothly, while other times, you get attacked or ambushed by the police. Dealing drugs is one of my favorite things to do in Chinatown Wars; Rockstar fleshed the entire thing out really well. Driving across town to sell a bunch of weed in an area where it goes for a high price is very satisfying, for example, and it helps that all the UI for the system feels professional and serious. FUN FACT: GTA Chinatown Wars is the only single-player GTA game starring an Asian American. The first time I played Vice City, a friend lent me his copy. He had to leave after a few hours, but I, desperate to keep playing, kept my PS2 on while taking the disc out. I was hopeful that the PS2 would let me keep playing, but that’s not how it works. Still, that moment is emblematic of how much I love this game. Bright pink neon, blue suits, bright yellow sports cars, and tons of cocaine: Vice City is the 80’s incarnate. Vice City also has one of the best soundtracks of the entire franchise, which is saying something. While I love Vice City, actually playing it again is a good reminder of how far the series has come. Vice City can feel clunky and unresponsive, especially when it comes to combat. Fighting multiple enemies can be a nightmare, because the lock-on system isn’t reliable. 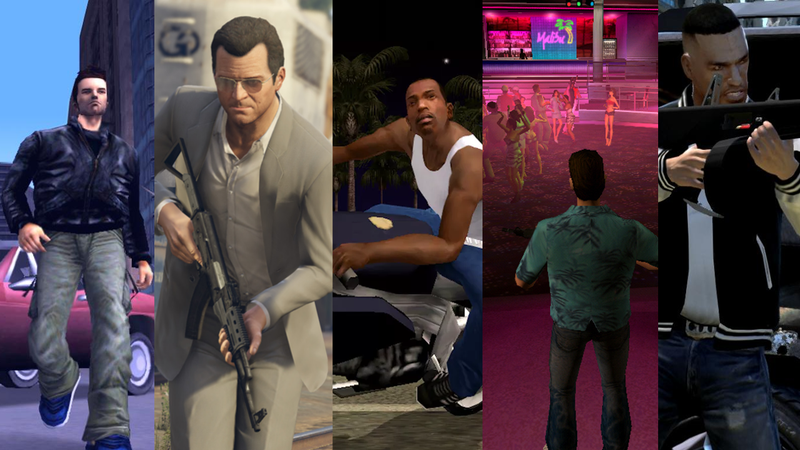 Still, the city, music and atmosphere help keep Vice City from aging too poorly. FUN FACT: GTA Vice City has billboards that reference Miami...so does Miami actually exist in the GTA Universe? Grand Theft Auto: Vice City Stories is Vice City, but with better controls and more things to do. GTA VCS also added a ton San Andreas-style features, such as swimming, gang wars, multiple outfits to wear, among other things. After years of watching Tommy drown, being able to swim around Vice City is a welcome change. FUN FACT: Most celebrities who appear in GTA tend to play a character—. Samuel L. Jackson, for example, was in GTA San Andreas, but as corrupt officer Tenpenny. In Vice City Stories, Phil Collins appears...as Phil Collins. Hell, he actually performs in Vice City. It’s a bit strange and of course, because it is GTA, someone wants to kill the famous musician. Vice City is great, but San Andreas is better, especially when it comes to the combat, visuals, and number of vehicles. San Andreas is a bigger game in nearly every way: you can fly jets, plan a heist, visit Las Venturas and gamble, buy property, take part in gang wars, drive a train, climb stuff, ride a bicycle, play basketball...the list goes on and on. FUN FACT: On PC, you can still mess around with GTASAMP, a multiplayer mod that has been around for a decade now. Wanna play San Andreas with other fans? Great news, this mod is still populated and active to this day. GTA IV divides fans. Some loved GTA IV’s serious tone, while others miss the wilder side of GTA. For me, it easily makes my top three. In GTA IV, combat finally feels modern: you can use the left and right triggers to aim and shoot, a change that makes combat feel natural. I also love the way the city looms over you as you look up. Plus, flying a helicopter in the night as New York Groove plays on the radio is still awesome. I also really enjoyed the driving in GTA IV, as it felt heavy and smooth, unlike the previous games. The result is that when you get good at driving in GTA IV, it actually feels like you learned a skill. Back when I played in multiplayer servers, I remember getting really pumped whenever I out-drived other players, especially if I managed to avoid an accident or ambush. GTA IV also featured the first major attempt at a GTA online multiplayer mode. Modes like Cops N’ Crooks, are still fun to play, and I enjoy that you can turn off parts of the game, like police or friendly fire. Having that sort of granular control made me feel like I was creating my own rules, my own special stories. Even the more recent GTA Online doesn’t feel that intimate. FUN FACT: My favorite easter egg in GTA IV are hippo-shaped trash bins, which you might recall from Manhunt. So then: where does Manhunt fit into the GTA multiverse? The DLC for GTA IV is better than the original release. Each DLC gives you a new perspective on Liberty City: Lost and The Damned is gritty and dirty, Ballad of Gay Tony is fun and glamorous. Once TBOGT was released I don’t think I ever played standard GTA IV online multiplayer again. Gay Tony added so many things that became must-haves, like parachutes, sticky bombs, tanks, golf, dancing minigames, mission scoring and large military-grade weapons. Ballad of Gay Tony also lightened the mood and had more fun than GTA IV. Nevermind the music: Ballad of Gay Tony took the already fantastic GTA IV soundtrack and stuffed it full of neon, fun and partying. Fun Fact: GTA Episodes From Liberty City added two new episodes of Republican Space Rangers, a cartoon you can watch on the in-game TVs. The main character of the series is voiced by Lloyd Floyd, who has done more voice work for Rockstar than any other voice actor. He also was the voice of the pigeon in this commercial. Full stop, GTA V is the best GTA game ever made. GTA V is easily the best-looking and best-playing game in the entire franchise, and a large part of that has to do with Rockstar’s attention to detail. You can knock over traffic cones, watch animals in the woods, read labels on cereal boxes. Hell, you can watch TV or even surf a totally fictional in-game internet. It’s wild. GTA V is also a joy to play, and in a single session you can alternate between the chaos of blowing up a train or robbing a bank to the beauty of parachuting over the desert at night. It’s wonderful. Then you have GTA Online. Yes some of the pricing is ridiculous, and the grinding to get the newest and coolest toys can take forever. But GTA Online is still a playground that I’ve lost hundreds of hours in. Driving around the mountains, doing missions, racing cars, starting large firefights with the police—these are all things you’ve done in GTA before, but being able to do it all with friends revitalizes the experience. The best part is, every few weeks or so, there’s a new vehicle or mode to play around with. GTA Online is constantly changing, and these updates—which are often free—add entirely new gameplay systems. Three years after the release of GTA Online and I’m still playing the game nearly every week; it still feels fresh. Fun fact: While GTA fans have spent years looking for UFOs, ghosts and Bigfoot across multiple games, most of those searches haven’t turned up much. Rockstar seems to have noticed this was a trend, because they included all three of those things in GTA V. That inclusion helps why the legend of Mt. Chiliad was so powerful in motivating people to look for a fabled jetpack. Putting nostalgia aside, as someone who has put an embarrassing number of hours into all GTA games, GTA V is the pinnacle of the series.